The gorgeous Ocean Hole Park. On Wednesday morning we said goodbye to the Exumas. We only had a short time to spend in these islands and missed much. 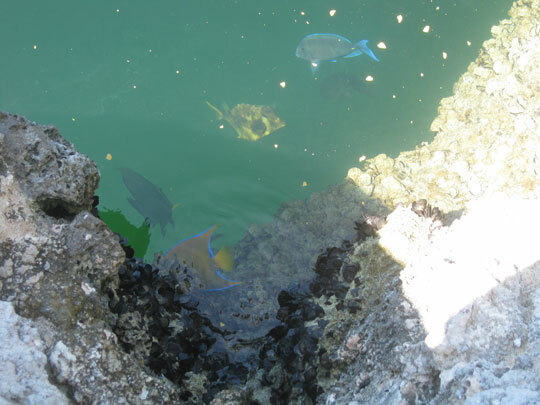 I would have liked to have seen the prehistoric iguanas at Allenâ€™s Cay, the ruins of a drug smuggling plane off of Normanâ€™s Cay, and the swimming pigs we had heard about from other cruisers. I didnâ€™t even look at what most of the islands had to offer since I knew we would only have time to visit a few. 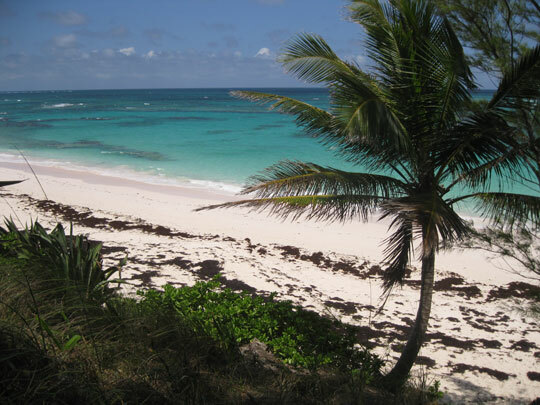 That morning the wind blew us on a close reach directly to Powell Point in Eleuthera. The seas were high. I stayed at the helm as long as I could before nausea forced me to be horizontal. Things eventually settled down and I was able to steer again as we made it safely back into the waters of the Bight of Eleuthera. Our destination was Rock Sound Harbour. This large harbor is 1.75 miles wide and 4 miles long. We anchored right outside of Rock Sound Settlement. It was surprisingly settled, peaceful, and a welcome place to drop the hook at the end of the day. The 600 feet deep inland ocean hole at Rock Sound. Its dark, still water is a little eerie in a place where you can usually see the bottom of any water near land. 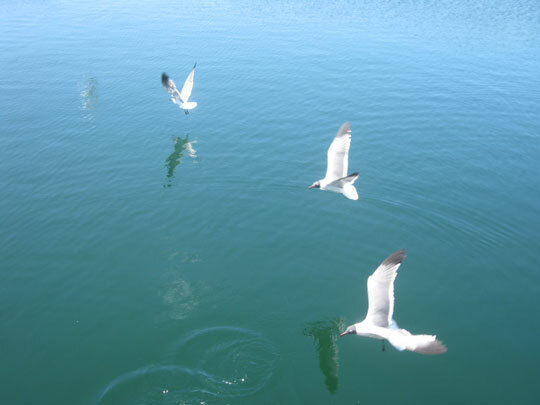 These Laughing Gulls are aptly named. They are a noisy bunch. Their ka-ka-ka-ka-ka-ka gets a little annoying after a bit. This guy wasn't interested in diving into the water for his Pringles. He stared me down until I threw him a chip or two. Thursday we did some exploring ashore. 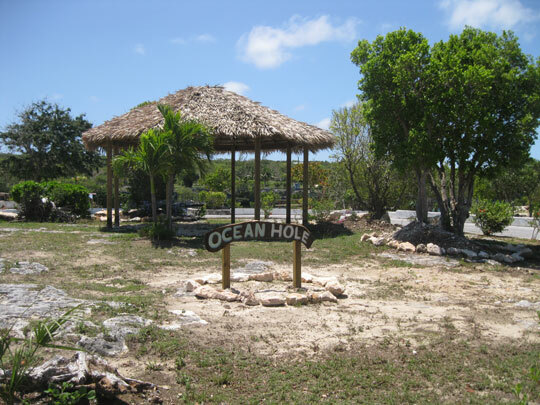 Our first stop was the Ocean Hole Park, not far inland from the townâ€™s center. 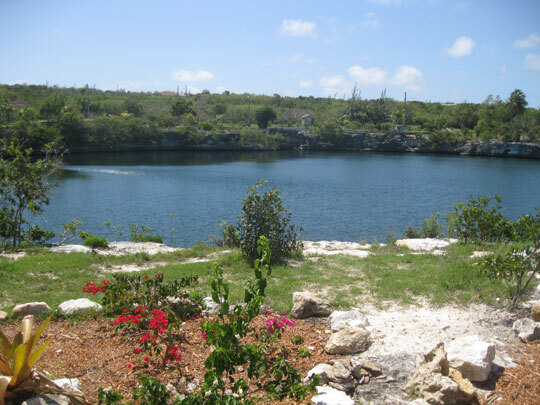 This is a semi-fresh water hole some 600 feet deep surrounded by a very nice, well-kept park. It is thought that the hole connects to the ocean through a series of caves. 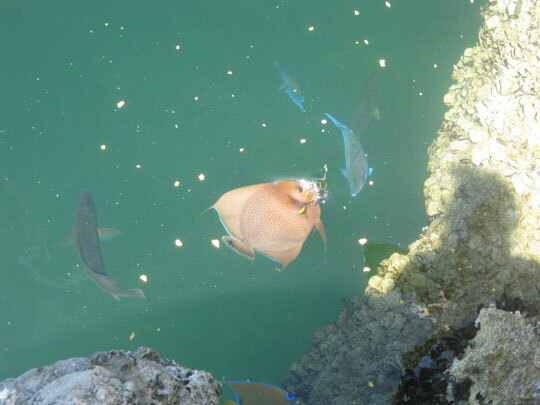 It is filled with tropical fish that swim to the surface for breadcrumbs. Unfortunately we had forgotten to bring any bread with us. Of course we wouldnâ€™t have wasted our homemade bread on fish anyways, but I could have cooked them some brown rice. Luckily they liked the Pringles we ended up buying them at Dingleâ€™s Convenience Store. There were quite a variety of fish in the hole. 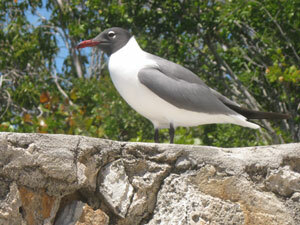 Gulls like Pringles too. These guys would circle over the water and dive bomb for the chips. Over the sand dune lies the Atlantic Ocean. 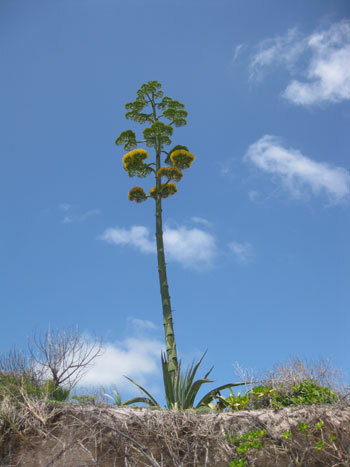 The Bahamas Century Plant produced a 25 foot high bloom once before dying. Not pictured: humming bird that was feeding on the yellow blooms. Back in town we had seen a sign pointing down the road where it indicated there was a restaurant on the beach 1.25 miles away. It seemed like a reasonable trek to see some sand and the ocean. Unfortunately the sign lied, but we did not realize that until we heard the Atlanticâ€™s roar beyond the sand dunes. It was over two miles to the shore and even further to the restaurant, which ended up being closed. After our walk back from the other side of the island we were pretty much completely exhausted. A grocery store visit was still on the do list for the day. I was very anxious to get some fresh fruit and vegetables. We were almost out of saltines and I had been rationing them out to Greg. I had also decided it was time to treat myself with a home made pizza. We needed cheese. The grocery store was at least a mile down the road from where we sat recovering from our walk to the beach. While we looked down the road contemplating the long hike, it occurred to me that I had seen a dinghy dock on the chart near where the store was. We boarded the dinghy, headed up the coast and sure enough there was a dock specifically for the Market Place Shopping Center and the inviting restaurant on the banks of the harbor. If you have been following along with this blog for some time, you know my enthusiasm for the huge Maxwellâ€™s grocery store in Marsh Harbour. Actually almost every market we have been to in the Bahamas has impressed me in some way. The Market Place was not a disappointment. The store was small, but had a good variety. The fruits and vegetables looked fresh and were reasonably priced. But what really surprised me was the type of items I am hard pressed to find in a Publix in the US. They had tofu, soy milk (both the refrigerated and non-refrigerated kind), Eden Organic Milk, Muir canned tomato products, Bobâ€™s Red Mill flours and grains, as well as natural and organic cereals and crackers. 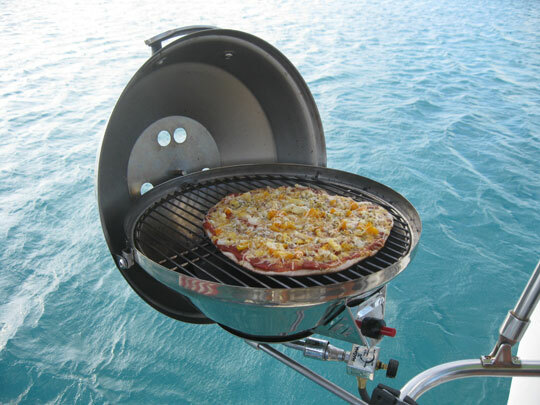 After I finished picking out some organic wheat cereal to eat for breakfast we headed back to Blue Wing where we grilled a wonderful pizza with homemade crust, Gregâ€™s pizza sauce recipe, fresh veggies and cheese. It was so nice to be back in civilization. 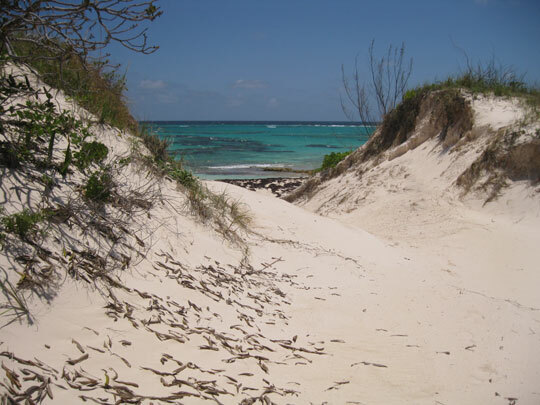 This entry was posted in Eleuthera, Life on the Water, The Bahamas, The Exumas. Bookmark the permalink.